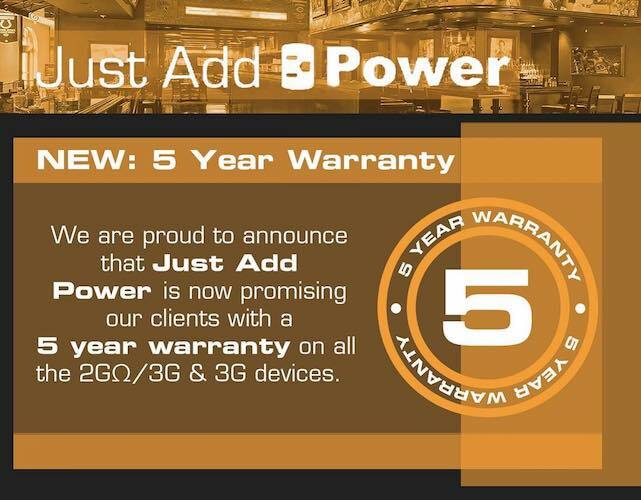 Just Add Power has added a five-year warranty for all HDMI over IP transmitters and receivers in the company’s 2GΩ/3G and 3G families. Effective immediately, the warranty covers parts and replacements for any 2GΩ/3G and 3G solution sold on or after March 1, 2019. J+P’s 2GΩ/3G transmitters and receivers allow integrators to build a scalable and cost-effective infrastructure to distribute sources up to 1080p resolution or meet evolving 4K requirements by mixing and matching devices, with 2GΩ devices on 1080p sources and 3G on 4K sources. The Ultra HD over IP family is designed for any size UHD distribution and matrixing application and includes a variety of devices that enable integrators to mix and match models to better manage their hardware budget on 4K HDMI projects – including 4K HDR distribution. The 2GΩ/3G+ solutions integrate seamlessly with all product generations of J+P, allowing integrators to build a future-proof infrastructure that suits any application requirement. Further, the 3G Ultra HD over IP models can be mixed and matched within the same gigabit network, providing a scalable systems approach to 4K video signal distribution requirements. Next article PowerHouse Alliance Invites Dealers to April Trainings Across the U.S.